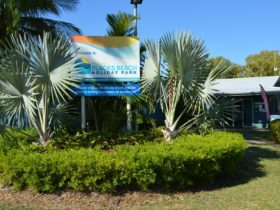 Offering one and two bedroom, spacious, fully self-contained, fully air conditioned apartments on the beach in Mackay’s Northern Beaches is The Shores Holiday Apartments. An alternative to a Mackay Motel or Apartment. 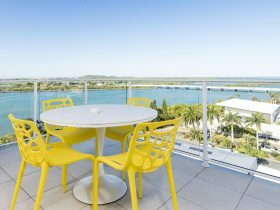 The property offers free Wifi, Foxtel television, two televisions per unit, undercover parking, two swimming pools, toddlers pool, spa, floodlit full size tennis court, electric and wood burning barbecues, beachfront viewing platform and much more. 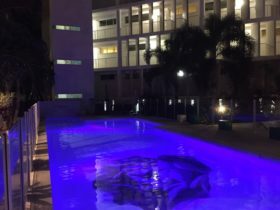 If you are looking for a quiet and relaxing place to stay in Mackay, try The Shores Holiday Apartments, 12 minutes drive from the centre of town. 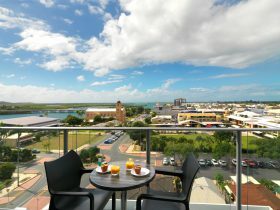 Apartments are ideal for a variety of short term accommodation needs. They welcome one to six people per unit. One bedroom units sleep a maximum of two guests and two bedroom units can sleep a maximum of six guests. 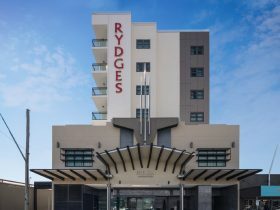 The Shores is located within walking distance to shops, including Mackay’s Golden Sun Chinese Restaurant, Blacks Beach Seafood Takeaway and the local Blacks Beach Tavern, and a short drive to the Mackay Golf Club, iconic Eimeo Hotel, Northern Beaches Central Shopping Centre and Northern Beaches Bowls Club. Book now for a great holiday on the beach, where you get much more than just a motel room. The townhouse apartments are two-storey and fully self-contained. There are two bedrooms, bathroom with bath and walk in shower, separate toilet and covered balcony upstairs. Bedroom one has a digital television. The fully equipped kitchen, with full size fridge, dishwasher, stove, walk in pantry and microwave oven, living/dining area with ipod docking station and CD player, DVD player, digital television, internal laundry, second toilet and covered patio are all located downstairs. All units are fully air-conditioned. Bedding consists of one queen size bed in bedroom one and two single beds in bedroom two. There is also a double sofa bed in the lounge room in some townhouse units. Standard Villas are two bedroom, fully self-contained low set apartments set amongst tropical gardens. They have a fully equipped kitchen, with full size fridge, stove, dishwasher, open plan living/dining area, ipod docking station with CD player, DVD player, digital television in the lounge room and bedroom one, laundry with washing machine and clothes dryer, separate toilet and covered patio. Most Standard Villas have a shower over the bath. Standard Villas are fully air-conditioned. Bedding consists of one queen size bed in bedroom one and two single beds in bedroom two. There is also a double sofa bed in the lounge room. Maximum number of guests is six. Beachfront Villas are spacious two bedroom fully self-contained apartments located near the beach and large open lawn area. The kitchen is fully equipped with large fridge, stove, microwave oven and dishwasher. The open plan lounge/dining room has dining and lounge seating for six guests, ipod docking station with CD player, DVD player and digital television, modern bathroom with walk in shower, separate toilet, laundry with washing machine and clothes dryer, and a covered patio. Beachfront Villas are lowset units. One bedroom Deluxe Villa is a fully self-contained one bedroom apartment located near the beach. The bathroom has a spa bath and walk in shower. The toilet is in a separate room. Deluxe Villas are fully air-conditioned ground floor apartments. Bedding consists of a queen size bed in the bedroom. Maximum number of guests is two. One Bedroom Beachfront Villas are spacious fully self-contained apartments located near the beach and large open lawn area. The kitchen is fully equipped with large fridge, stove, microwave oven and dishwasher. The open plan lounge/dining room has ample dining and lounge seating for two guests, ipod docking station with CD player, DVD player and digital television, modern bathroom with walk in shower, separate toilet, laundry with washing machine and clothes dryer, and a covered patio. 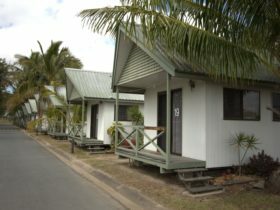 Beachfront Villas are lowset units. Bedding consists of one queen size bed in the bedroom. Maximum number of guests is two. The bedroom, bathroom with bath and walk in shower, separate toilet and covered balcony off the bedroom are upstairs. There is a digital television in the bedroom. Bedding consists of one queen size bed in the bedroom. The one bedroom Standard Villa is a fully self-contained, low set apartment set amongst tropical gardens. It has a fully equipped kitchen, with full size fridge, stove, dishwasher, open plan living/dining area, ipod docking station with CD player, DVD player, digital television in the lounge room and bedroom, laundry with washing machine and clothes dryer, separate toilet and covered patio. The one bedroom Standard Villa has a walk in shower and is suitable for persons with mobility issues. Deluxe Villas are fully self-contained two bedroom apartments located near the beach. Prices are per unit using existing bedding and vary with unit type and length of stay. Extra guests AUD25 each per night. Maximum of six.